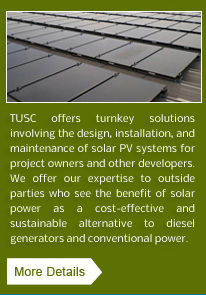 Solar PV systems that are connected to the national grid and feed power into the grid are called "on-grid" systems. On-grid systems vary in size from residential (2-10 kW) to solar power stations (more than 1 MW). In the case of residential or building mounted grid connected PV systems, the electricity demand of the building is met by the PV system. Only the excess is fed into the grid. 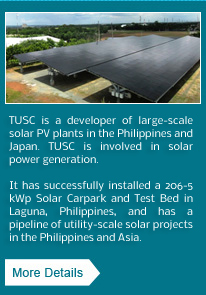 Large-scale or utility- scale solar power plants are called "megasolar" plants and comprise of large rows of solar panels whose output is fed to a distribution or transmission line of a utility or a direct end-user such as industrial plants and high-load buildings. • Barangays "electrified" by SPUG generating plants that have become too inefficient and/or expensive. 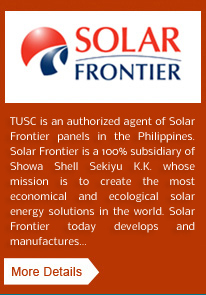 These off-grid solar PV systems can be in different sizes (capacity) depending on the usage (load), available area for installation, and configuration.